Cylinder locks generally require changing when you move house, or another common situation is if you lose your keys. A typical variety of cylinder lock is the Yale lock shown below. These locks may literally be changed in a few minutes – its really not necessary to hire a locksmith or carpenter, and unless there is a problem with the lock body itself, you literally just replace the cylinder part as shown below. 1. On the inside, simply unscrew the retaining screws that hold the lock body in place. 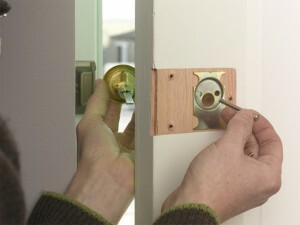 In this example the screws go into the face of the door – with some locks there will be retaining screws on the door edge. 2. Unscrew the long retaining screws that go through the mounting plate and door. This will release the cylinder. 3. Simply insert the new cylinder, threading the lock connecting bar through the central hole in the mounting plate. Then, reposition the retaining screws. Sometimes, you may need to cut down the length of the lock connecting bar. You can simply measure the new lock against the old and see if the length requires cutting down. You may either snap the bar at the appropriate length with pliers, or, use a junior hacksaw to cut it down to size. 4. Tighten the retaining screws to secure the cylinder in place. 5. Now refit the lock body ensuring that the lock connecting bar engages in the lock body. Tighten the retaining screws, before opening and closing the door and making sure the key works smoothly in the new lock. This entry was posted on Tuesday, December 14th, 2010 at 12:07 pm	and is filed under 'How-to' Guides, Doors and Door Security. You can follow any responses to this entry through the RSS 2.0 feed. You can leave a response, or trackback from your own site.